There are thousands of marijuana strains, with more being bred. Many of these types of marijuana are obscure only known by a select few. All of these have some medical benefit to the user. 1) Sativa – Gives you a high, uplifting feeling and a general sense of well being. The effects are more cerebral and less feeling of being stoned within your body. It can be used to treat Multiple Sclerosis and Epilepsy. Durban Poison Cannabis and Haze Marijuana are excellent Sativa marijuana strains. 2) Indica – Provide a pleasant body stoned sensation. It is commonly used for depression, anxiety, pain relief and Insomnia. Northern Lights marijuana and White Widow are considered to be among the best Indica Cannabis strains. 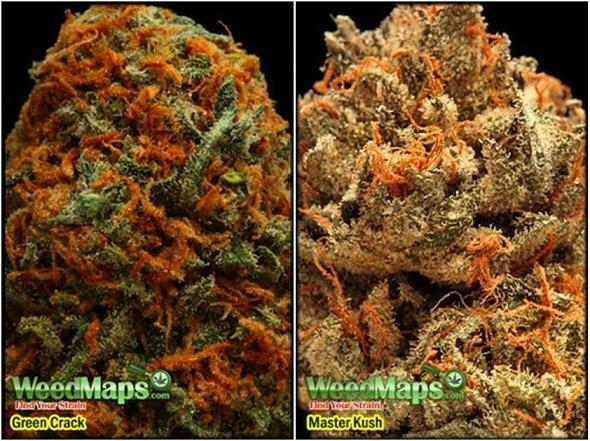 There are also strains which are a combination of Indica and Sativa. To find out more about the differences between these categories of weed visit our Sativa vs Indica post. white widow Weed – Depression, Anxiety, Reduced Appetite , Cachexia, Hepatitis C and Post-Traumatic Stress Disorder. purple kush Weed – Pain, Depressive Disorder and Anxiety. Blueberry Marijuana – Chronic pain, Arthralgia, Muscle pain, Diarrhea, Muscle spasm, Insomnia, Emotional lability, AIDS, Nausea, Gastrointestinal disorder, Anorexia, Depressive disorder and Anxiety. It can be difficult to work out which weed strain you should use to treat your condition. There can be several different strains which can be used to help you with your ailment or you may have multiple medical conditions. In this case it may be necessary to smoke more than one strain. Also you may build up a resistance to a particular strain, so varying the types of marijuana can be effective. Your marijuana doctor is the best person to help you choose the right type of marijuana or an experienced budtender can potentially help. Make sure you find out the background of the budtender to see whether they are in a position of authority to give advice on medical marijuana strains. Our medical conditions page has recommendations of which strains to use to treat particular conditions. Please have your say on which marijuana strains should be used to treat particular conditions at our forum. Even though marijuana (read: cannabis sativa or cannabis indica) is, according the US Justice Department, “one of the safest therapeutically active substances known to man”, it still remains illegal. That’s why there’s precious little facts scientists know about the plant and the substances the plant produces. What we do know however, is that Cannabis is an extremely complex plant that’s divided up into three species, two of which are psychoactive and one (cannabis ruderalis), which isn’t. To be clear, both Cannabis indica and Cannabis sativa are annual plants in the Cannabaceae family. Cannabis indica is a putative species of the genus Cannabis. The strain probably originated from the Hindu Kush mountain range in central Afghanistan, which is known for extraordinarily frigid winters and searing hot summers. This gives the plant a short, dense look, oftentimes with broad, forest green colored fan leaves. The leaves darker color is due to their higher amounts of chlorophyll. The flowers (or ‘buds’) are generally heavy and fragrant and they tend to grow in pod clusters. Indicas are the faster growing varietal, typically with flowering times between 6 to 9 weeks. Even though the indica plants are smaller, their denser nugs usually yield higher amounts than sativas, plus they lend themselves to indoor growing better since the plants don’t get as tall as the sativas. Indica is typically the variety most associated with being ‘stoned’, eg sitting on the couch, deep feeling of relaxation behind your eyes, loosening of your limbs and muscles. Your physicals senses are typically heightened such that listening to music, eating food or touching different textures feels incredibly rewarding. Indicas are great for relaxation due to their higher CBD and CBN levels than sativas (although some indicas also contain large amounts of THC as well). Some of the most potent medical marijuana for body pain, anxiety and appetite loss come from Cannabis indica, including Master Kush, G-13, Bubba Kush and others. If Cannabis indica is Ernie, than Cannabis sativa is Bert. Cannabis sativa tends to grow tall and thin, with smaller leaves that are brighter in color. In fact, a Cannabis sativa plant can grow up to 25 feet or higher in a single year! Most sativas grow in the 8ft -12ft range and originate from Mexico, Thailand and Colombia. Since they grow taller and use less chlorophyll, flowering can take between 10 to 16 weeks. The yield on a Cannabis sativa plant is typically lower than the indica, but on the flip side the buds are usually more potent and THC more concentrated. The fruity, sweet marijuana strains are almost always sativas. Cannabis sativas have higher THC content than most indicas and producing more of a ‘head high’. Typically, the effects of a good sativa are a soaring head high, almost like a rush, followed by an energetic feeling that stimulates brain activity and heightening senses. Sativas can be great for depression. Some examples of popular sativa medical marijuana strains are Green Crack, Blue Dream and Super Lemon haze (and pretty any other Haze). Now of course one plant may exhibit qualities that are germane to both sativa and indica. This plant is typically known as a ‘hybrid’ and very often hybrid strains can be bred to cultivate the best qualities of the sativa and the best qualities of the indica in one super plant. OG Kush is an example of an excellent hybrid strain, so is Super Silver Haze. In fact, most plants are hybrids and very few growers will claim their plants are ’100% sativa’ or ’100% indica’ with any real authority. Although the Dr. Grinsppon strain (named after Harvard author and activist Dr. Lester Grinspoon) found at Barney’s in Amsterdam may just be an exception to this rule, as it exhibits extremely prototypical sativa traits, such as barley even flowering. Article From The Medical Marijuana Blog and republished with special permission.